ORF74 responds to certain angiogenic CXC ligands (called ELR + CXCLs) as agonists and angiostatic ELR-CXCLs as inverse agonists (ELR refers to the conserved amino acids located just prior to the first Cys in the protein). CXC chemokines that are involved especially in acute inflammatory reactions (for example, IL-8) do not affect the high level of constitutive signaling (Fig. 1B). Interestingly, ORF74 in fact binds basically all human CXC chemokines, including IL-8, with high affinity. Competition binding experiments with multiple radiolabeled ligands have revealed different active and inactive conformations that apparently do not readily interchange. 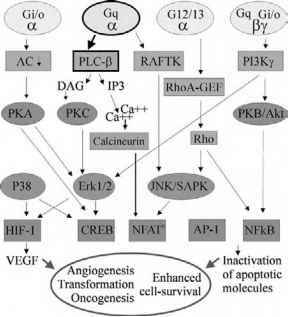 The constitutive activity per se as well as the regulated activity are important functions for oncogenesis [4,5]. Figure 2 Multiple downstream signaling pathways are activated by ORF74 from HHV8. Several levels of effector molecules have been implicated as being part of the signaling cascade elicited by ORF74 from the G-protein activation (yellow) over a variety of signaling molecules to gene transcription regulation through control of at least five different transcription factors (orange) in the cell nucleus. The diagram is grossly simplified, and several suggested cross-regulations between the depicted enzymes have been excluded. For abbreviations, see footnote for Table 1. Although US28 binds all human CC chemokines with nanomolar affinity, none of the ligands appears to affect signaling by the receptor. 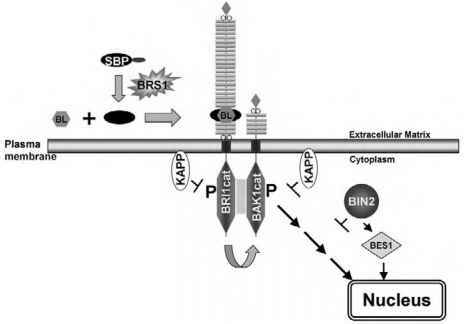 It has been suggested that the receptor could function as a scavenger, picking up the CC chemokines from around the infected cell and rapidly inactivating them through internalization. The favored ligand for US28, however, is membrane-bound CX3C chemokine fractalkine, which acts as a partial inverse agonist. Surprisingly, the fractalkine binding cannot be blocked by the otherwise high-affinity binding of CC chemokines. The membrane-anchored fractalkine may serve as a cell-entry gateway for human CMV via interaction with US28 expressed on the surface of infected cells and the virion .